Have you always wanted to visit one of Europe's most stunning countries, its Alpine peaks soaring in the distance and Mozart playing in the background? How about living in a country so centrally located, you can easily travel to at least five other countries within a few hours' train ride? With our new Teach English in Austria program, not only can you visit this wondrous nation but you will also be welcomed into an Austrian family as their English tutor. With placements all throughout the country, including Vienna and Salzburg, you will get the rare opportunity to live with a host family and tutor them in English for 15 hours a week during a 4-12 week period. You are not required to know German; as long as you are a native English speaker between 18 and 40 years old, have at least a high school diploma, have some prior teaching or tutoring experience and have good lesson planning and organization skills, you are eligible for the program. 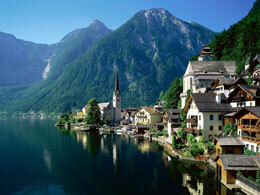 You don't need a visa either; visitors to Austria who are there for 90 days or less can enter the country visa-free. In addition to your placement in a carefully screened host family, you will receive full room and board, pre-departure and in-country assistance from InterExchange and our international cooperator in Austria, access to discounted international accident and sickness insurance, 24-hour emergency assistance, and an ISE card.